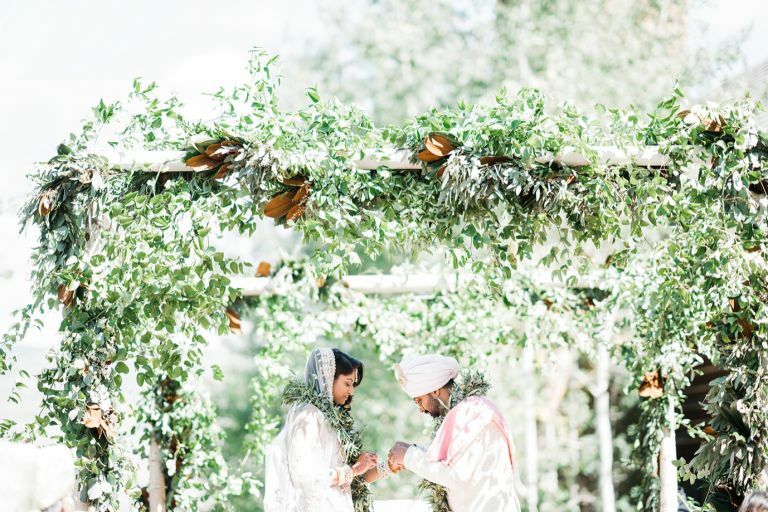 Members of the Indian community are looking for Hindu priests who can perform weddings, pujas, samskaras, and funerals in a way that not only combines knowledge and technique, but most importantly— the ability to communicate with and involve everyone present. For instance, weddings are more diverse than ever. 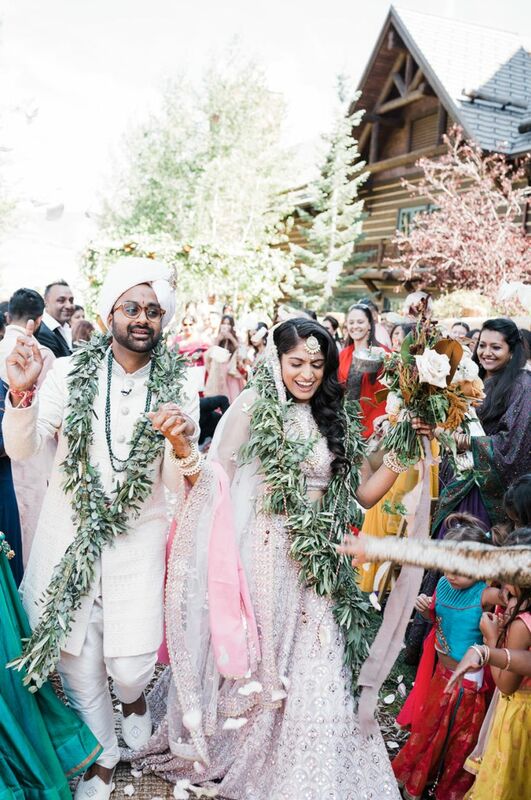 Often the bride or groom comes from a non-Hindu background. 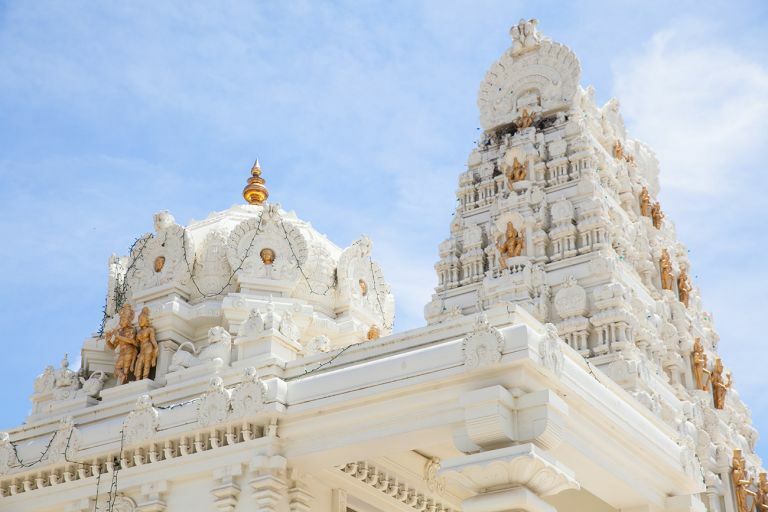 Families want a Hindu priest who is sensitive to these differences and who performs each ceremony so that everyone appreciates the depth and richness of our culture — while enjoying the event. Today there’s a great need for all Hindus, especially children, to understand the relevance of our religious rituals, culture, and philosophy in their lives. Otherwise in due course these things will gradually be lost. If you feel this way too please take a few minutes to explore my site. Dharmasetu dasa is a disciple of His Divine Grace A.C. Bhaktivedanta Swami Prabhupada, Founder-Acharya of the International Society for Krishna Consciousness. In 1974 he began his formal studies of Vaishnava culture and philosophy in Boston. In 1977 he moved to his spiritual master’s ashrama and temple in San Diego. He was an instructor at the seminary for eight years and held different administrative positions until the early 90’s. 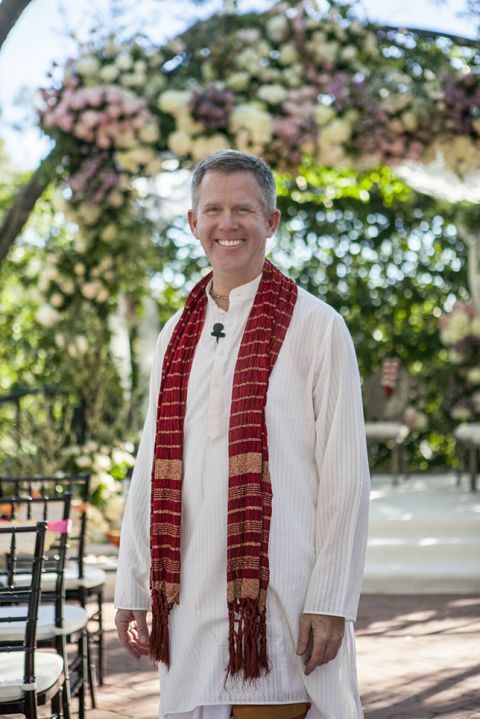 During this time he also held administrative and teaching positions at two Vaishnava primary schools – one in Southern California and the other in Mississippi. Since 1987 he has been serving our Hindu community primarily as a purohita, performing weddings, funerals, rites of passage, and various religious ceremonies in peoples’ homes. He studied under Dr. Shukavak Dasa (Sri Sri Laksmi Narayan Mandir, Riverside, CA), Sriman Gaura Kesava Dasa (Sri Rangam/Hawaii), and Sriman Ramananda Raya Dasa (Three Rivers, CA). 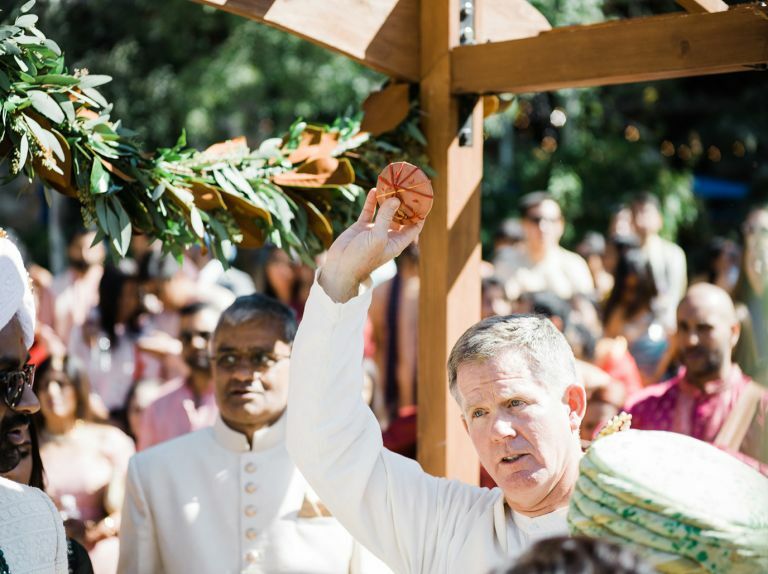 Dharmasetu das performs pujas and Hindu weddings throughout California, the United States, as well as Mexico and Canada. He is available to travel to any domestic and international destination. His warm and friendly demeanor, his ability to communicate the meaning of the ceremonies he is performing, and to involve the participants and audience have made him a sought after pandit. He lives in San Diego, California with his wife, Jahnavi and they have two beautiful daughters, Cintamani and Tulasi-priya. 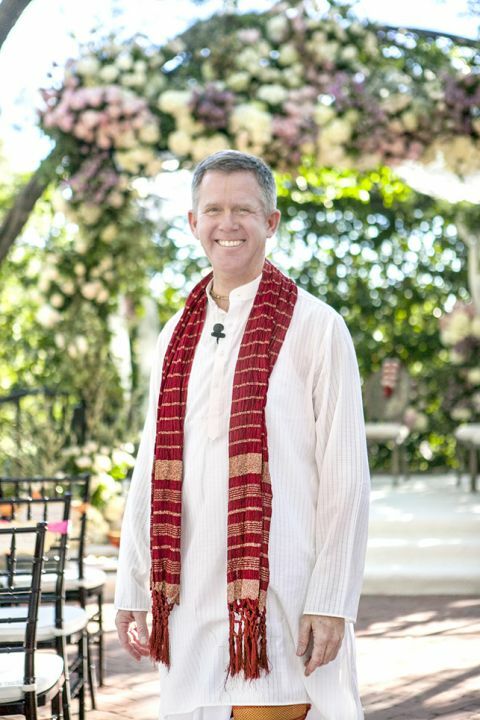 For over 25 years he has been serving our Hindu community primarily as a purohita, performing weddings, funerals, rites of passage, and various religious ceremonies in peoples’ homes. He studied under Dr. Shukavak Dasa (Sri Sri Laksmi Narayan Mandir, Riverside, CA), Sriman Gaura Kesava Dasa (Sri Rangam/Hawaii), and Sriman Ramananda Raya Dasa (Three Rivers, CA). Over the last 25 years it’s been a pleasure and honor for me to serve our community by performing Hindu religious ceremonies. It’s my priority to make each function as stress-free and enjoyable for everyone involved by being organized, punctual, easy to work with, and respectful. 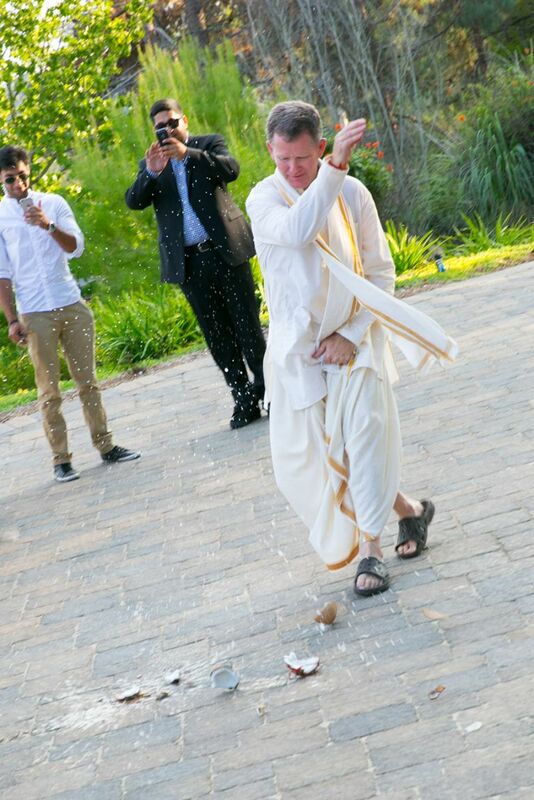 I perform pujas and weddings in San Diego, Orange County, Los Angeles, the Bay area, throughout California and to any domestic and international destination. 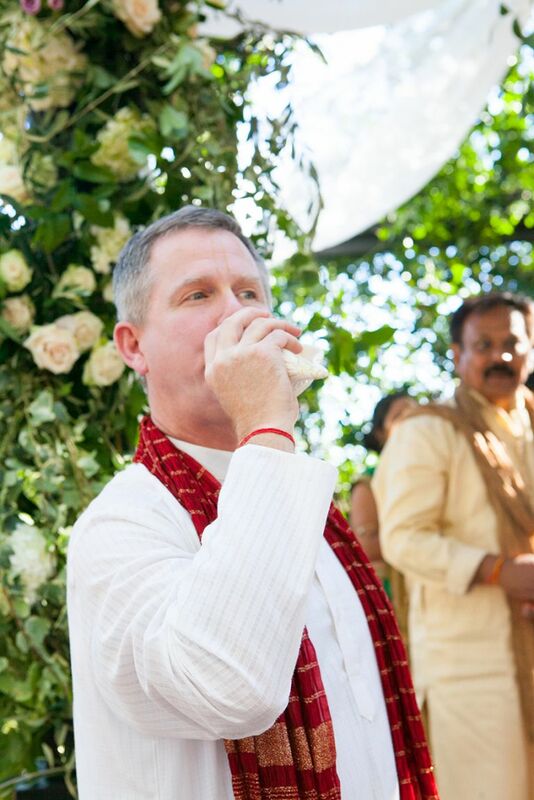 For years I have been performing Hindu weddings in Cabo, Puerto Vallarta, and Cancun Mexico. All donations and daksina are tax-deductible. Dharmasetu Corporation is a registered nonprofit operating in California with 501(c)(3) approval from the Internal Revenue Service. All donations are tax-deductible to the extent allowed by law. 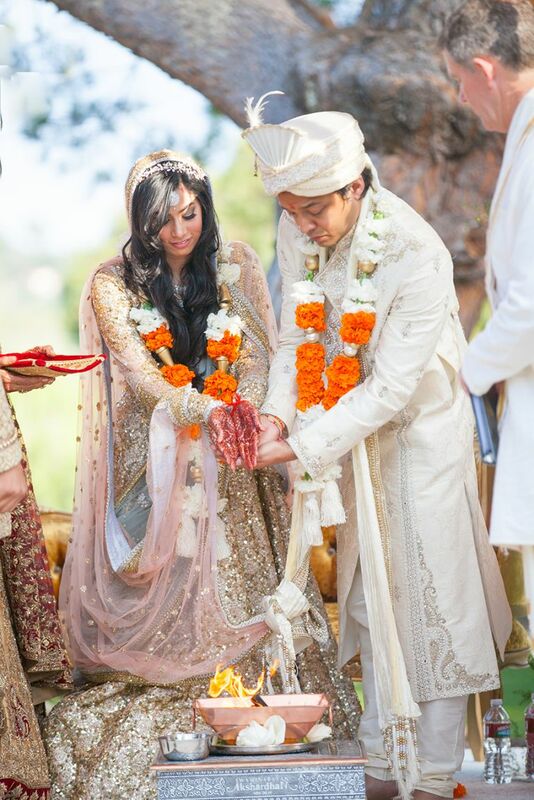 Weddings: I perform weddings from the different regions of India as well as Jain and Arya Samaj. 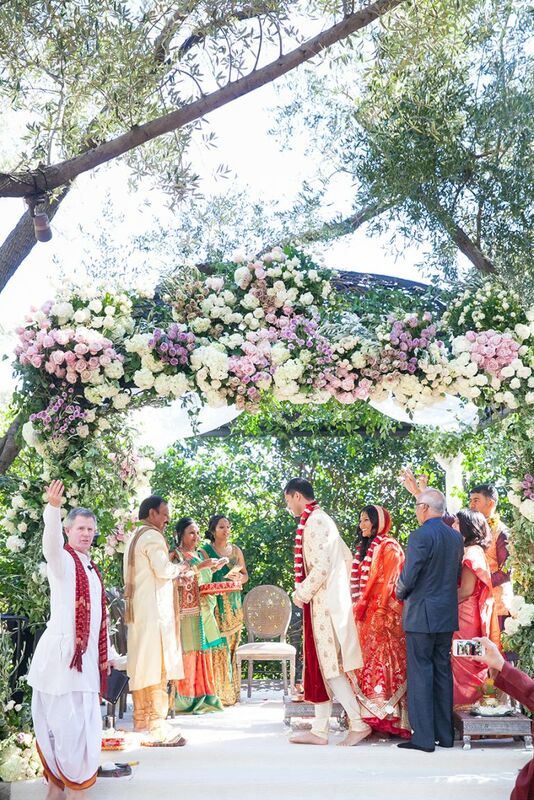 Many of the weddings I perform are a fusion of Hindu and another religious tradition (Christian, Jewish, Buddhist, etc. 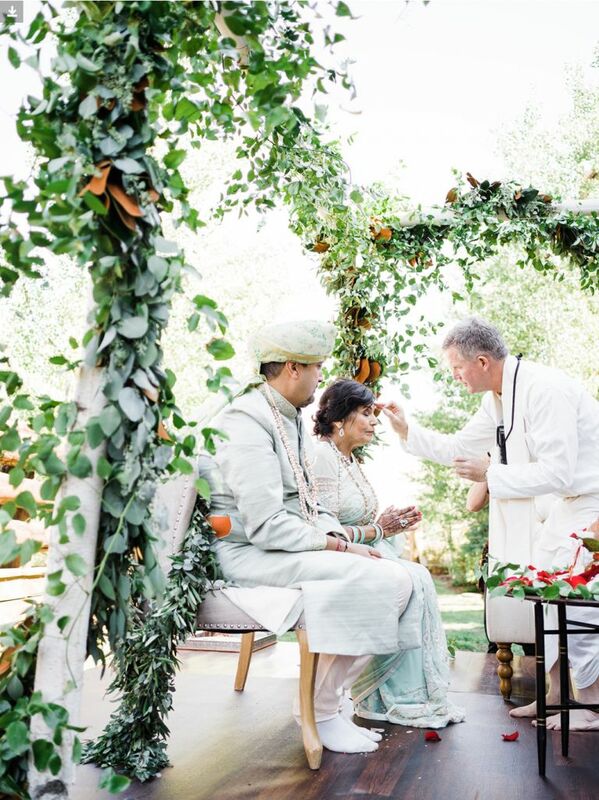 many times along with an officiant from another religion) All the ceremonies are performed in a traditional manner with Sanskrit prayers and traditional steps. The couple’s vows are in English and I explain each step of the ceremony so everyone present can understand and enjoy the ceremony. Pre-wedding Ceremonies (Grahashanti, Ganesh Sthapanam): Performed for bride and grooms’ families before the wedding along with the peeti (haldi) ceremony. Vag-dhanam: Engagement ceremony with parents of both the bride and groom. 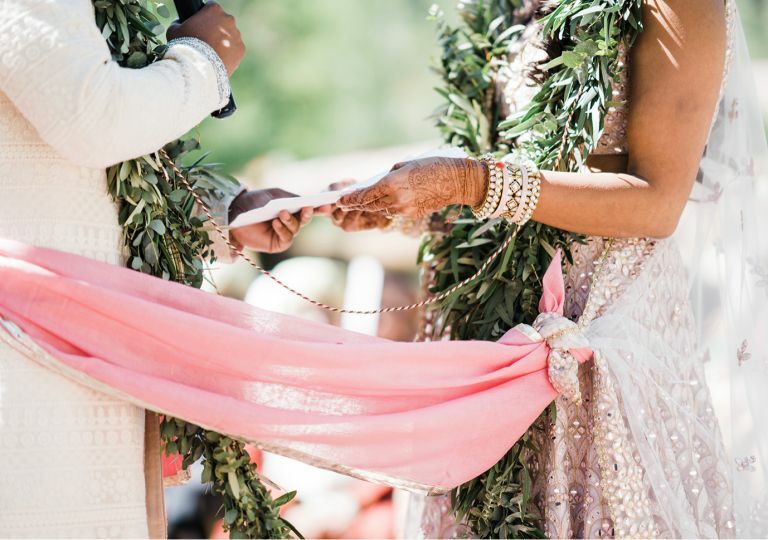 Includes the exchange of words between the fathers, exchange of rings and or garlands of the couple, giving of gifts and somethimes Laksmi puja and havan. Sri Satyanarayan Swami Puja and Katha: Performed with pujas of Ganesh, Sudarshan, Navagraha devatas, Sri Laksmi devi and Sri Satyanarayan Swami. Pancamrita snanam of Sri Satyanarayan and katha. Very popular puja for good fortune and the blessings of the Supreme Lord. Griha pravesh/Vastu puja (house warming puja): Performed usually just before moving into a home (can be done after the move in). Includes vastu puja and havan, Front door (Dwar) puja, Vishnu puja, and purifying the home of any negativity before moving in. Sraddha (memorial service): Performed usually on the eleventh or thirteenth day after a person passes away. Included offering of tarpana, pinda dan (maha prasada rice offered to the deceased) and a shanti homa. Also performed annually on the day of the person’s passing away or on the Amavasya mahalaya day. Funerals (antyesthi): Performed with traditional rituals at the time of viewing and cremation. Simantonnayanam: (baby shower puja) Performed in the fourth, sixth, or eighth month of the pregnancy to bring about a peaceful state of mind for the mother and unborn child in the womb (and husband). Nama karana (name giving ceremony): Performed on the tenth, eleventh, twelfth, twenty-first, hundred and first day , one year after birth, or an auspicious day like a full moon. Officially giving the child their name. Anna prasana: (feeding the first grains to the child) Performed usually during the sixth or eighth month after birth for boys, or for girls during the fifth, seventh, or ninth month. It is recommended that the child is fed a light rice pudding that is Vishnu maha prasadam. The ceremony is performed to bestow upon the child good health and a long life. Paushtika karma: (for continued health) Performed on the birthday of the child. Cuda karana or Mundan: (hair cutting ceremony) Performed during the child’s first (best option), third (second best option), or fifth year (third option). Bestows health, longevity, and beauty to the child. Upanayanam: (giving of the gayatri mantra and sacred thread, reformatory rites of a brahmana boy) Performed between the eighth and sixteenth years. The priest helps the father give the brahma gayatri and sacred thread to his son as he received it from his father. Instructions are also given on the meaning of the mantra and brahminical/sattvic lifestyle. Shanti Homa: Ceremony to bring about internal and external peace in one’s life. A sacred fire (homa or havan) is the main part of the ceremony. Bhumi/Vastu puja: (ground breaking ceremony for construction of residential or commercial buildings) Performed for an auspicious beginning of the construction. Asking for blessing from Bhumi mata, Vasturaj, and Lord Vishnu. Mrityumjaya Havan: Performed for health and longevity. Worship of Sri Narasimhadeva with 108 offerings and recitations of the mrityumjaya mantra. 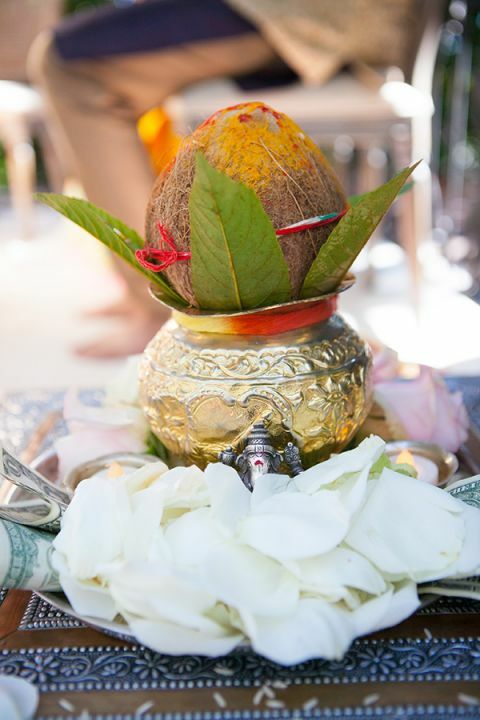 Sri Maha Laksmi Puja: Performed for prosperity and good fortune, many times at the start of a new business venture or opening of a new business office or facility. 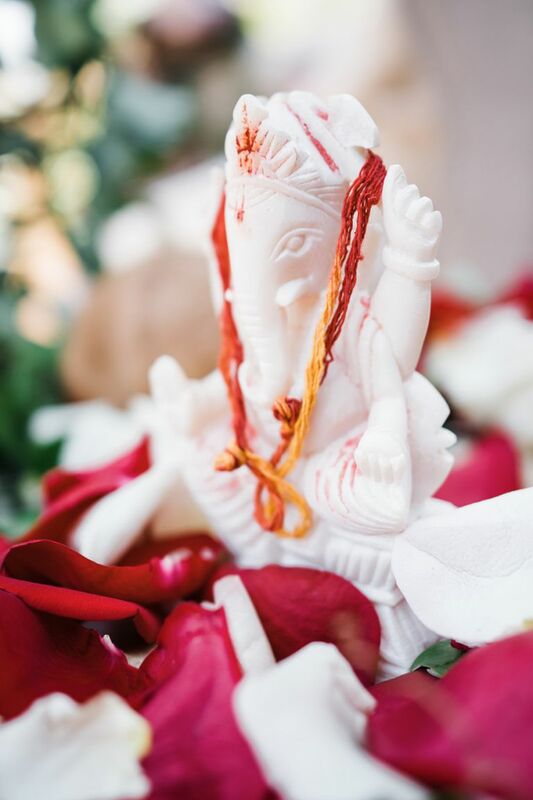 Ganesh and Sri Narayana are also worshiped. Murti Installation: (pratistha) Performed for temple or home altar, simple or complex. Vastu consultation: I do simple vastu readings for residential and commercial properties. Many times home buyers ask for this when looking at new homes. Vastu readings help one understand the flow of positive and negative energies in the home or business which can influence one’s physical and mental well being. Classes for adults and children (balvihar) in Bhagavad gita, Vedic/Hinduculture, and Vaishnavism. Payment options can be in the form of cash, check, PayPal or venmo. Thank you again for performing at our Mandvo/wedding. We really appreciate it - more than you know! We were delighted with the delivery and presentation of your service. You kept everyone informed and engaged even through difficult conditions. All we can say is keep up the great work you are doing. Thanks again for your service and your care during our time together. Hi there, thanks for stopping by! Fill out the form below to tell me a little more about you and the events. I will get back to you as soon as I can to schedule a time to get to know one another better. Looking forward to meeting you!